Antivirus Pro 2017 is the PUP that uses misleading techniques to prevent removal. Use Reimage to locate malicious components and get rid of them faster than with uninstall instructions. A full system scan blocks virus reappearance and prevents traffic to malicious domains. What is Antivirus Pro 2017? How can Antivirus Pro 2017 infect my computer? Antivirus Pro 2017 is a dangerous program that belongs to ‘rogue anti-spyware’ category. What does that mean? The main thing that you have to realize that each of its system scanners and reports is fake. In addition, you should also keep in mind that this program promotes the fake licensed version, which should never be purchased. Otherwise, you will lose your money. So, if you have just started to see Antivirus Pro 2017 scanners that claim that your computer is infected, you should check your computer with legitimate and reputable security software. It will help you to see what the real situation is. We are sure that you will be informed about this rogue anti-spyware and other components that belong to it. If you still have doubts, read what is said about its previous versions, such as Antivirus Pro 2015, Internet Security, Smart Security, Privacy Protection and many other ones. Each of these programs tries to look like a reputable anti-spyware. As soon as it enters computer, it starts “scanning” the system and reports about detected cyber threats. The biggest problem in this is that these “threats” are in reality either legitimate programs or invented malware that wouldn’t be detected if you would check your computer with a real anti-virus or anti-spyware. Besides, Antivirus Pro 2017 malware, just like its predecessors, tries to make users to pay for its license, so it fails to remove these detections. For that it asks to pay for its license versions, which is fake and should never be purchased. If you don’t want to lose your money, you should ignore each of Antivirus Pro 2017 alerts and also run a full system scan with updated anti-spyware. In this particular case, we highly recommend you to use one of these applications: Reimage, Malwarebytes MalwarebytesCombo Cleaner. This rogue anti-spyware has been actively promoted with a help of fake notifications and infected email messages. So, the main thing that you have to do in order to avoid Antivirus Pro 2017 is to stay away from these things as far as you can. If you have just received an email that looks suspicious (it is actively trying to convince you to download its attachment, it is full of grammar or typo mistakes, etc. ), you should ignore it. Please, do NOT click links and do NOT download attachments that can be found in such emails. In addition, you should also ignore pop-up notifications that may interrupt your browsing. If the alert claims that you need to update your Java, Flash Player, FLV Player and similar program, it might be fake. In addition, if it offers you to win an iPhone, iPad or similar prize, you should also stay away from it as far as possible because you can be redirected to a malicious website that is used for spreading Antivirus Pro 2017 virus. Once this rogue enters computer, it drops its files and starts system modifications that are needed to it for getting ability to start the work as soon as PC is rebooted. In addition, it starts showing its forget scanners and reports about invented viruses. Beware that keeping such threats on the system is very dangerous because they can not only interrupt you with their fake notifications. They can also try to infect your computer with additional threats or can also steal personal information from your computer. If you want to avoid that, you should follow a Antivirus Pro 2017 removal guide that is given below. If you think that your computer is infected with Antivirus Pro 2017 virus or other rogue anti-spyware, the first thing that you should do is to remove it from your computer ASAP. For that you should run a full system scan with a reputable anti-spyware and get rid of malicious files. Otherwise, you may discover more viruses on your PC after some time. Of course, before you run your security software, you have to update it. If you need a detailed guide explaining how to do that, read this guide. 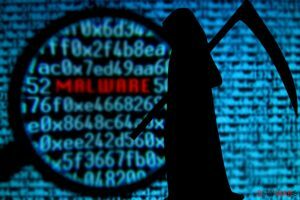 When trying to remove this threat, our recommended programs are Reimage and Malwarebytes MalwarebytesCombo Cleaner because they can easily detect every hidden component that belongs to this and other cyber threats. 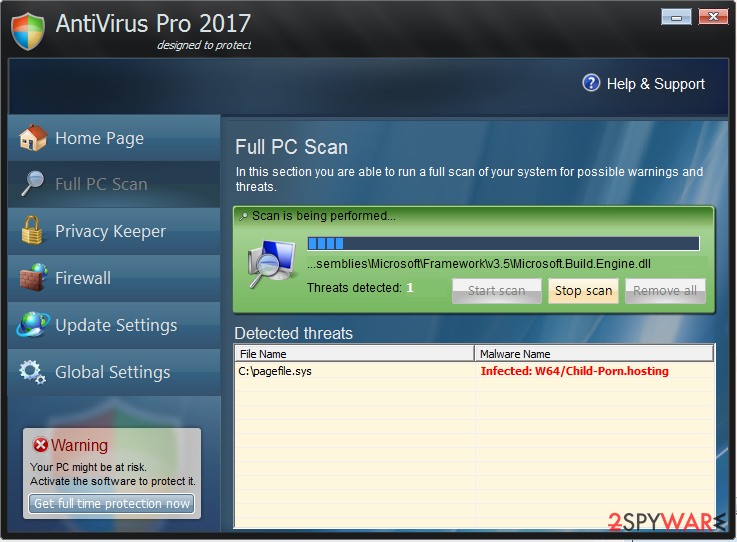 Let Antivirus Pro 2017 start its work and finish its fake system scan. Download SpyHunter and remove malicious files that belong to Antivirus Pro 2017. This entry was posted on 2015-05-25 at 04:48 and is filed under Rogue Anti-Spyware, Viruses. You can quickly scan the QR code with your mobile device and have Antivirus Pro 2017 manual removal instructions right in your pocket. How did you remove Antivirus Pro 2017?